Lately survival knives have become an extremely hot topic. Often we get a call from a curious customer asking us what we think is the very best survival knife. As you may expect, around here at BladeOps the opinions vary. Some of us like a knife that is more along the lines of a tactical knife that will function as either a combat knife or as a survival knife. Others of us like the straight up survival knives. To set up the conversation, we want to make a few clarifications. 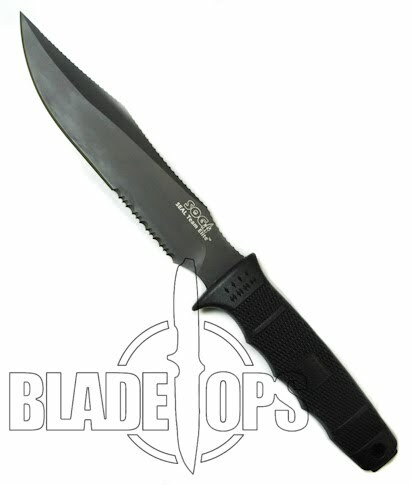 Tactical Knife: a knife that is all black, most probably designed for combat. A great example of this would be the Blackhawk QDC Mark I folder. Survival Knife: a knife that is designed to help you out in the wild. If you are stranded and lost, this should be a knife that will help you survive in whatever situation you may find yourself. An example of this would be the ESEE Knives Rat 3 or Rat 4 knife. 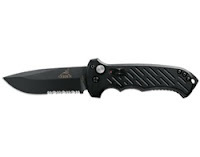 Combat Knife: a knife designed specifically for military and police applications. Often these knives feature more narrow blades and may be “tactical” or they may have stainless steel blades. In this genre–think the Mark II by Gerber. As with any set of definitions, there is quite a bit of crossover within each definition. For instance, the Mark II is a combat knife and is also a Tactical Knife. Some people may even classify it as a survival knife. The purpose of this blog entry is to find out what are your favorite Tactical and Survival knives? Let us know which knife and why. We carry several different styles of Gerber automatic knives. 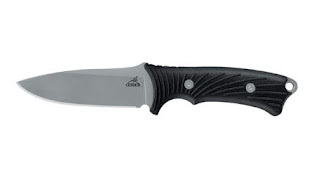 One of the most popular auto knives from Gerber that we carry is the Gerber Covert. This knife is an Applegate-Faribairn design and has a very generous oversized trigger button that makes it simple to activate. The Covert is fairly narrow and is a great auto knife if you are looking to carry one in your pocket or in a small pouch. If you are looking for a larger knife, both the 06 series of auto knives as well as the D.M.F. auto knives by Gerber fit the bill. These larger sized automatic knives are fairly similar in size and action. The DMF series (which stands for dual multi function) can be opened either right or left handed as they have a slide trigger inset in the handle. You pull the slide and the blade opens. The 06 series feature a similar shaped handle but with a large oversized button that makes it easy to open if you have bare hands or you are wearing tactical gloves. All of these automatic knives are well built, solid products–just like you would expect from Gerber. If you are looking for an automatic knife, a Gerber knife may be just what you have been looking for. We just recieved a shipment of Gerber Automatic Knives. So it looks like we have pretty much all the different styles they make. Even the Coverts. Recently, if you didn’t already know, Gerber began producing quite a few different automatic knives. One of the most recent styles is the DMF automatic knives. They have a great trigger system that makes them equally useful for both right and left handed users. 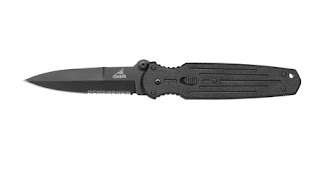 Gerber just released two new automatic knives. They are essentially the same knife, with two different blade styles available. You can get the modified clip point or the tanto point. The D.M.F. automatic knife (DMF stands for dual multi function) has one of my favorite style opening triggers. Similar in nature to SOG’s Arc-Lock system or Benchmade’s Auto-Axis system, the DMF has a dumbell shaped trigger that spans the width of the knife and can be accessed from either the right or left side. This trigger rides in a channel. When you want to trigger the knife open, you just pull it down with a finger or thumb and the blade snaps out. The DMF knives have incredibly fast action and good, tight lock up. They are made with G-10 handle’s which give it strength but don’t add too much weight. But one of the things I like best about the DMF is the integrated pommel strike. Many of the new Gerber automatic knives have this, it is an angled piece of the tang that extends out beyond the base end of the handle. It can be used for breaking glass to escape a dangerous situation or as a great strike point if such is needed. The Gerber DMF auto knife sits comfortably in my hand and has a definite utilitarian feel to it. This is the kind of knife I want with me when I am out in the world and need a tool that will get the job done. 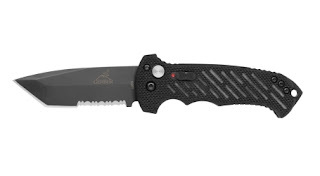 Gerber just recently released an updated version of it’s 06 auto knife. This new version has some really great upgrades. First, the speed of the blade is significantly increased. Second, they lightened the load. By making the handle of CNC machined G-10, the weight of the entire knife has been reduced significantly. The third thing Gerber did is to make the pommel on the end an integrated piece of the knife. You can use this sharp corner to break glass in an “I need to get out” type of situation. This is an absolutely fantastic automatic knife. Made entirely in the USA, it has great new features. 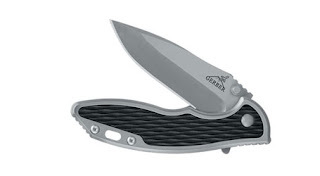 Comfortable to hold and use, this Gerber auto knife is one to consider. You should see a sharp increase over the next month in the number of different Gerber knives we have in stock. We are moving to carry the full line of Gerber knives. Of interest, just yesterday we got the Torch I manual folder in stock. Great knife. It has a nice smooth open and is comfortable in the hand. Also watch for the Big Rock Camp Knife. It should hit the store in the next few days and for the price could be the best inexpensive survival knife we have seen. For those of you who love the Gerber brand and are looking for a manual opening knife, this version of the Covert knife is absolutely fantastic. This knife has a nice smooth opening mechanism. The blade comes out easy and then it locks up. With the blade made of 154CM stainless steel and the handle made of FRN (short for fiberglass reinforced nylon), this Covert knife is plenty strong to get the job done. Gerber makes some really great knives. I think the Covert series definitely falls into that category. Great knife at a great price. We are currently boosting our stock on Gerber Knives. We have added about 10 new models over the past few days and will continue adding over the next couple of weeks. Check them out at the site. Gerber makes some really good every day carry knives that are classics. 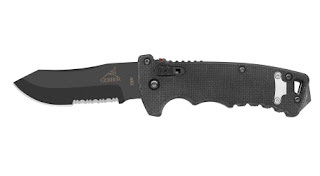 One of my favorites–that should be added in the next couple of days is the Gerber Covert spring assisted knife. There are a couple of variations of it. The spring assisted version of the Covert knives have the FAST system by Gerber which gives them a nice kick open and they are great for a wide variety of uses.